RK keeps looking at Madhus audition tape and drinks…! 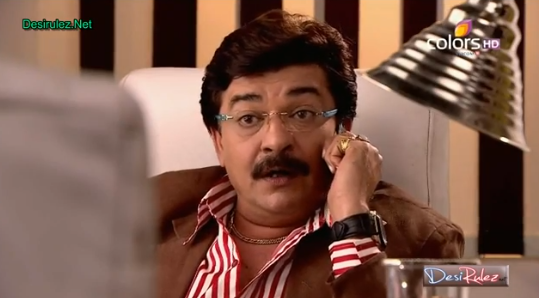 Madhu keeps calling him but no answer! He drools on Madhus smiling face n tries to touch it. 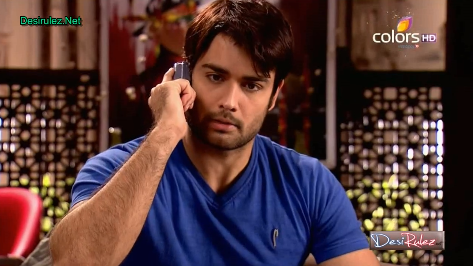 Madhu calls Bittu and asks about RKs whereabouts…n he says to come to trial room near the set..! Madhu comes n asks RK what he is doing? RK says i see her daily but focussed today … ! RK says forget m ur hubby ..ur my wife.. see this dream…! He reminds Madhu of her past… Pallos struggle…her birth on the set..! He says.. one day a superstar would have seen her and cast her opposite him …Madhu says would say no..! RK says he wont listen to u ..! It was all destiny..! RK says taqdeer ko kuch aur hi manzur tha..likha hua kabhi nahi mit-ta..! Look at Gods screenplay … i got banned… producing my own movie. .all actresses rejected. .but she… is the one… n Mehul approves..! RK says says yes..! Madhu says no.. even if she din marry RK ..she would not be before the screen..! She says.. my dream is not to be in movies. .my dream is to. .be RKs wife.. have his kids ..raise them ..n make a home.. not films! RK says she has so much talent …that she can create magic on the world ..RK says would she say no if a superstar says work in my movie? Madhu says no.. n what if a hubby asks? Madhu is not able to answer and RK passes out almost.. ! RK says have my heroine.. but cannot pressurise her coz of my compulsions..
Kuku tells Amar..that he made big promises.. but his movie work is going gud. .n his movies mahurat is in two days..! Amar says he din have any heroine. n that bank manager… Kuku says he gave 2 days time. n in that..he has to launch the movie..! Kuky-Sikky bicker… ! Dips watches Madhu arrange for the puja and taunts.. busy buttering n Pabho asks she wont do the same? Pabho asks what did she do for the puja n Dips says cleaned it..with cleaning powder..! Pabho chides her. .n asks to work ..properly ..! Pabho shares Guruji gonna come in the evening …first home to be purified then will come on set..! RK reads newspaper with titles of his movies mahurat.. n is frustu.. he doesnt answer Bittus calls even! Bittu calls on landline.. n Madhu too hears the convo on parallel line..! RK says.. the girl is irritating. .but we dun have option ..! Bittu is not very sure..! 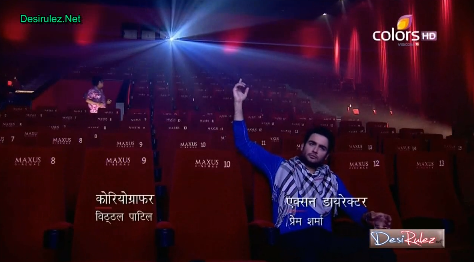 RK says audience will come to see me.. ! Bittu says Madhu is perfect for this n RK says wont force her.. she said no already..! Bittu says what if movie doesnt work ?? RK says m there to manage! Kuku greets Mehul and taunts him for working with RK …after having such illustrious career..! 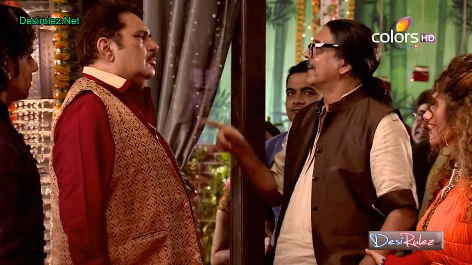 Mehul taunts Kuku back n says.. still eating for free at RKs place and burping stinkers? Mehul says we are sailing on same boat ..
Madhu comes to RK and he says to scold? Getting ready..! Madhu takes out clothes for him n says that heroine? RK says.. whenever u feel jelaous.. see your own face in the mirror.. you will see world’s most beautiful girl there! RK says btw i like yellow.. the color u ate my head to choose last year..! Madhu self thot. .know ur hiding ur troubles …but what to do? Precap – Kuku tells Amar that Simmy got packet..! Kuku asks what is in it? Amar says have patience… there will be mahurat… bank manager there but heroine.. wait n watch! Dips monitors the preps and self thot thank God Radha briefed me in advance ..! Madhu is walking down the stairs looking lost and comes to greet the team of Mehul and crew..! Roma teases Dips as Mehuls could have been heroine..! Pabho asks Madhu why so worried ..all well? RK says whose hubby is RK..nothing bad can happen in her life..! RK says Ganpati Bappa came at our home and its Mahurat of movie! RK teases Mehul saying.. woh aaye hamare dar pe…n then asks for heroine..
Simmys mom falls at RKs feet seeking forgiveness and RK is shocked..
RK introes Simmy to all as his movies heroine..! He introes his family to Simmy calling Kuku parasite.. then his mom ..n Madhu ..! Simmys mom says she looks like hindi film heroine..! She says if not Simmy, RK would have made Madhu a heroine..! Madhu tenses n RK says.. Bappa is waiting ..! Simmy says hungry and her mom says eat after retirement..! Pabho worries why Guruji is taking so long..! Sikky asks Kuku what plans? Kuku gives him a gift packet and says to exchange with Simmys gift packet! Dips almost catches Sikky but he averts in time! Madhu asks RK why sneaking from other door? RK says.. coz Simmy n her mom are bees… and Madhu says she is ur heroine… ! RK says. 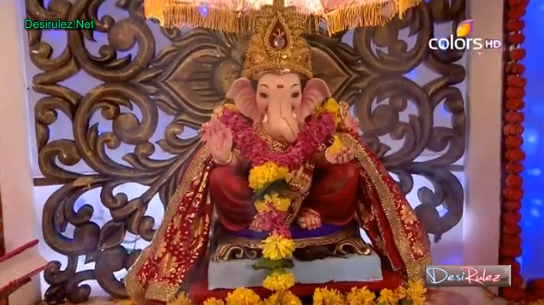 .Bappa tell Madhu .. ‘Woh meri Biwi hai.. uss heroine ki bua nahi’ ..! RK reminds of last year and Madhu sulks… RK says where u found this antique piece? 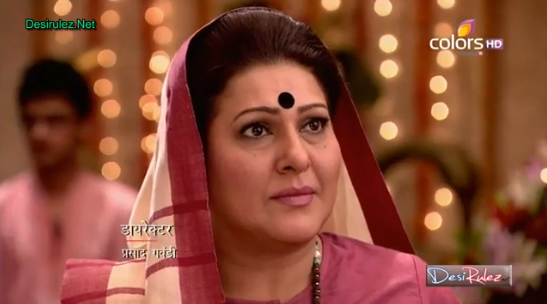 Kuku informs Amar that the gift packet has been delivered to Simmy and Amar says good … ! Kuku asks whats in it? Amar says.. muhurat will be there.. bank manager will come ..but heroine..
Madhu prays that may Bappa support RK in his fight to beat the wrong doers..! The duo take blessings of all elders! RK invites all to attend the muhurat…and invites Kuku as well…!! All clap ..! Precap — Mehul asks Madhu what he can say to make her agree? Madhu says lemme go! Mehul says.. when she came to ask him to make the movie..he said no but she din relent..! He says .. can only request u .. and the one who can force her.. RK .he wants to ask her but his love for her is stopping him!